517 Beacon is located on the south side of Beacon, between Massachusetts Avenue and Charlesgate East, with 515 Beacon to the east and 519 Beacon to the west. 517 Beacon is one of ten contiguous houses (511-529 Beacon) designed by architect Samuel D. Kelley and built in 1887 for Chadwick & Stillings (N. Henry Chadwick and Oscar L. Stillings), a hat block and flange company that became a significant house building firm in the 1880s and 1890s. 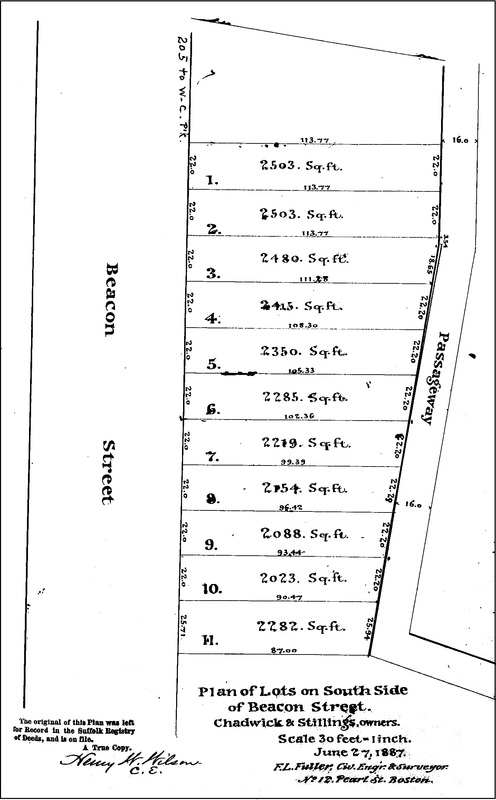 They are shown as the owners and builders on the original permit applications, all dated March 14, 1887. The next year, Chadwick & Stillings built one more house, also designed by Samuel Kelley, at 531 Beacon. 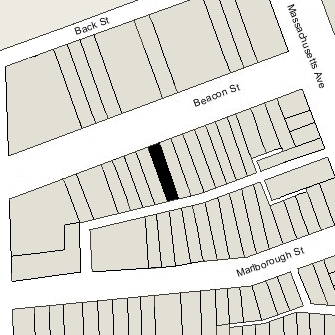 Click here for an index to the deeds for 517 Beacon, and click here for further information on the land west of Massachusetts Avenue between the south side of Beacon and the north side of Commonwealth. On June 21, 1888, 517 Beacon was purchased from N. Henry Chadwick and Oscar Stillings by Allen Lafayette Joslin. He and his wife, Sarah Ann Emerson (Proctor) Joslin, made it their home. They previously had lived in Oxford, Massachusetts, where he was a shoe manufacturer and bank president, and where they continued to maintain a second home. Living with the Joslins were their son, Elliott Proctor Joslin, and Allen Joslin’s daughter, Ada Luella Joslin, by his first marriage, to Lucretia M. (Shumway) Joslin (who died in 1863). Allen Joslin’s son by his first marriage, Homer Shumway Joslin, lived in Oxford and later would succeed him as head of his shoe manufacturing company. Elliott Joslin graduated from Harvard Medical School in 1895. 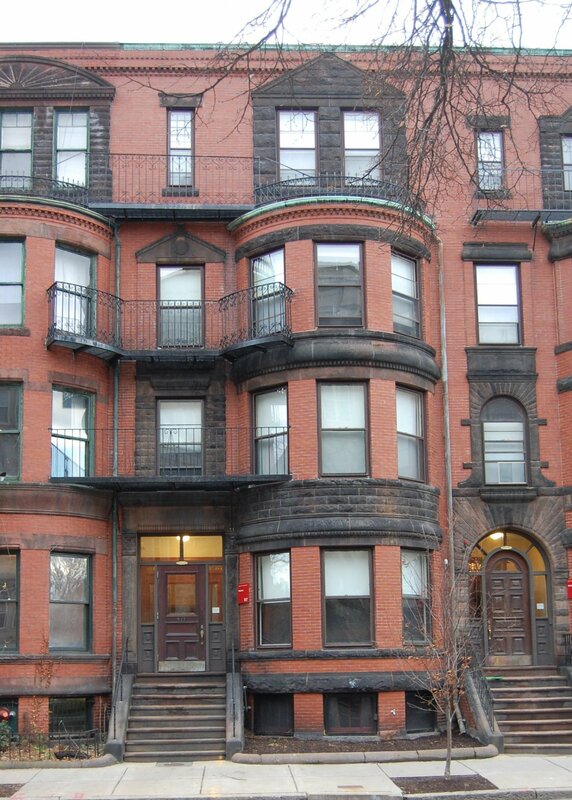 He continued to live at 517 Beacon with his parents and maintained his medical office there from about 1898. In September of 1902, he married Elizabeth Elliott Denny. After their marriage, they moved to an apartment at 421 Marlborough. He continued to maintain his office at 517 Beacon until 1905, when he moved his residence and office to 81 Bay State Road. Elliott Joslin was a pioneer in the treatment of diabetes and founder of the Joslin Diabetes Center in Boston. Allen Joslin died in July of 1911. In his will, he left 517 Beacon to his wife. Sarah Joslin and Ada Joslin continued to live at 517 Beacon until Sarah Joslin’s death in June of 1913. In her will, she left her residuary estate, including 517 Beacon, to her son. Elliott. Ada Joslin continued to live at 517 Beacon during the 1914-1915 winter season, but moved thereafter to Oxford. By the 1916-1917 winter season, Elliott Joslin had leased 517 Beacon to the MIT chapter of the Phi Sigma Kappa fraternity. It previously had been located at 16 Exeter. 517 Beacon remained Phi Sigma Kappa’s fraternity house until about 1925, when it moved to 487 Commonwealth. After Phi Sigma Kappa moved, Elliott Joslin converted 517 Beacon into a lodging house and leased it to various operators. By 1927, 517 Beacon was the home of Bror A. Pearson, a plumber, and his wife, Martha J. (Johansen) Pearson, who operated it as a lodging house. They previously had lived at 557 Columbus Avenue. They continued to live and operate a lodging house at 517 Beacon in 1930, but had moved to 390 Marlborough by 1931. By 1932, 517 Beacon was the home of Mrs. Signe Eleanora (Svenson) Woods, the former wife of Harold Spry Woods, who operated it as a lodging house. Her sister, Mrs. Ruth (Svenson) Johnson, widow of John T. Johnson, lived with her. Ruth Johnson purchased and moved to 519 Beacon in November of 1936, converting it into a lodging house. 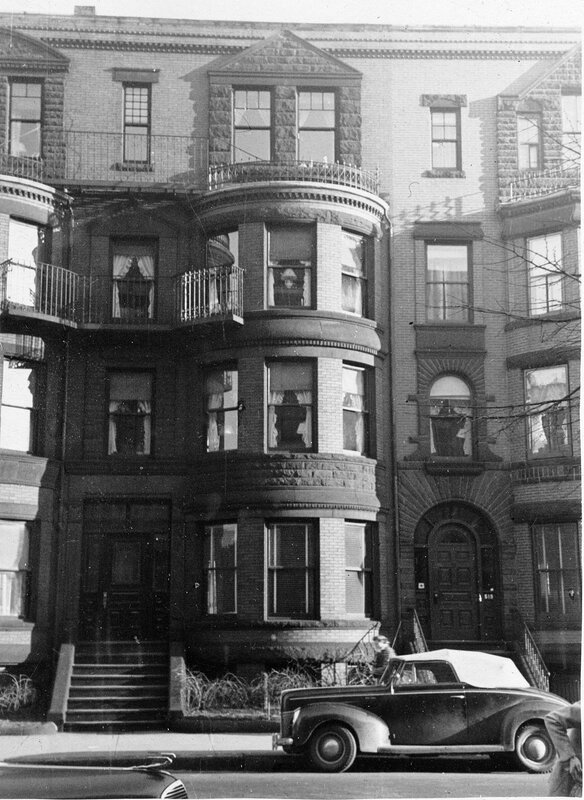 She continued to live there until about 1947, when she moved back to 517 Beacon to live with her sister. Signe Woods and Ruth Johnson continued to live at 517 Beacon in 1948, but moved thereafter. On April 28, 1948, 517 Beacon was purchased from Elliott Joslin by Mrs. Izetta May (Butler) Small, the former wife of Earle Augustus Small. She owned and lived at 519 Beacon, where she operated a lodging house. On May 3, 1948, Izetta Small transferred 517 Beacon to Grace Hoskins, who operated it as a lodging house. In December of 1948, Izetta Small applied for (and subsequently received) permission to cut a connecting door between the two houses, presumably so that they could be operated jointly. She died in March of 1949 and named Grace Hoskins as the executor of her will. On January 3, 1949, 517 Beacon was acquired from Grace Hoskins by Albert L. Hollingdale and his wife, Margaret E. (Tabor) Hollingdale. In June of 1949, they acquired 519 Beacon from Izetta Small’s estate. They operated lodging houses at both addresses. The Hollingdales lived at 82 Bay State Road. In May of 1953, they acquired 425 and 427 Marlborough. By the mid-1950s, 517-519 Beacon were operated as the Hollingdale Hall dormitory, and 425-427 Marlborough were operated as the Tabor Hall dormitory. On August 25, 1955, the Hollingdales transferred 517-519 Beacon and 427-427 Marlborough to themselves as trustees of the Hollingdale Hall Trust. On September 1, 1960, 503 Beacon, 517-519 Beacon, and 425-427 Marlborough were acquired from the Hollingdales by real estate dealer Hugh Richardson Farrington and his wife, Clara Marcellina (Cormier) Farrington, as trustees of the Hugh J. Trust. In November of 1961, they acquired 521 Beacon. On May 24, 1968, 517-519-521 Beacon were purchased from the Farringtons by Boston University. The Farringtons retained 425-427 Marlborough and sold them in April of 1969 to Kenneth L. Shaw. Boston University continued to operate 517-519-521 Beacon as dormitories for BU students. The legal use of the buildings remained as lodging houses, however, and in July of 1980 the University filed for (and subsequently received) permission to legalize the occupancy of 517 Beacon as a dormitory, reflecting its current use. In October of 1980, it filed for (and subsequently received) similar changes in use for 519-521 Beacon. 517 Beacon continued to be a dormitory in 2018.